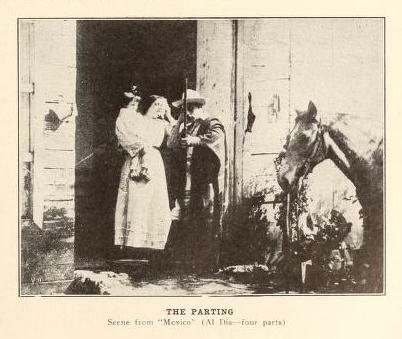 La película tuvo dos anuncios de página entera; uno por semana durante la primera quincena de febrero de 1914. El primero en The Moving Picture World y el segundo en The Motion Picture News. Sobre esta cinta, los mismos semanarios norteamericanos publicaron dos breves crónicas donde una de ellas está firmada por Hanford C. Judson. 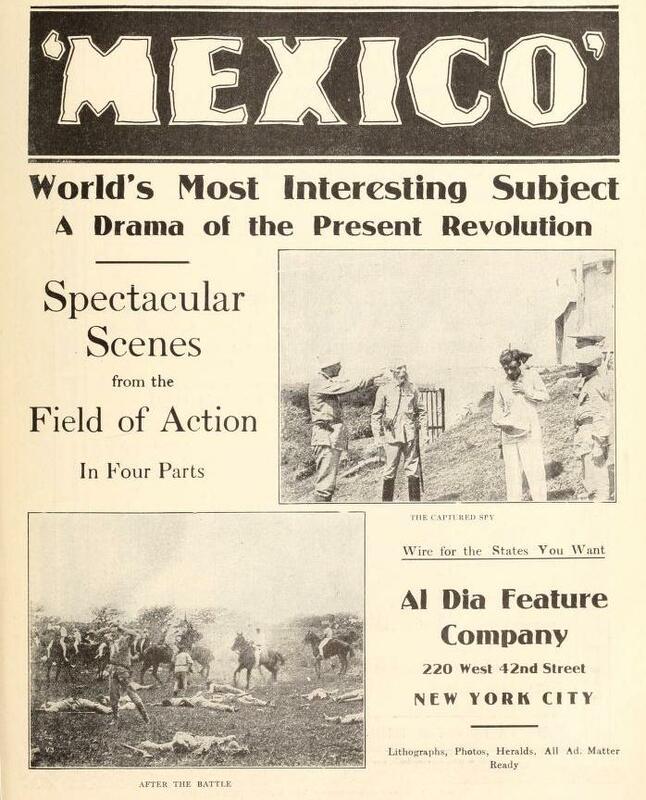 La primera, publicada en The Motion Picture News del 21 de febrero de 1914 (Vol. IX, no. 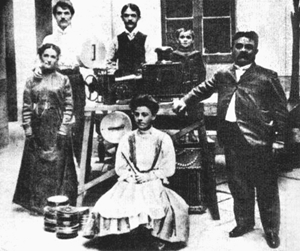 7, p. 35) es, como se acostumbraba en esa época, un boletín de la casa productora, pues era común que se enviara una breve sinopsis de las películas previas a su estreno para ser incluidas en las diversas publicaciones para interesar al público en ellas. Lopez, a youthful farmer, tells his wife, Rosa, that he has been ordered to the front with the Constitutionalist army to which he has sworn allegiance. Toro, a lieutenant in the Federalist army, arrives just after the departure of Lopez, and is struck by the beauty of Rosa. Not finding any conscripts in the house except her old father, he forces him to join the Federals as a surgeon. His attempts to steal Rosa are frustrated and so he calls on a spy he has caught for assistance. Lopez, hearing from this man that his wife is not true to him, leaves his regiment without permission and goes to his home to ascertain the truth of this assertion. Here he finds out that it is ungrounded, but is captured on his way back to join his regiment. After a trial he is found guilty of being a spy and sentenced to be shot. His old father-in-law manages to free him in a miraculous manner, and after much wandering he rejoins his army. Together with them he marches against the Federal troops, and after a decisive battle forces them to break and run. Toro, the villain, is killed and steals away to the woods to die. 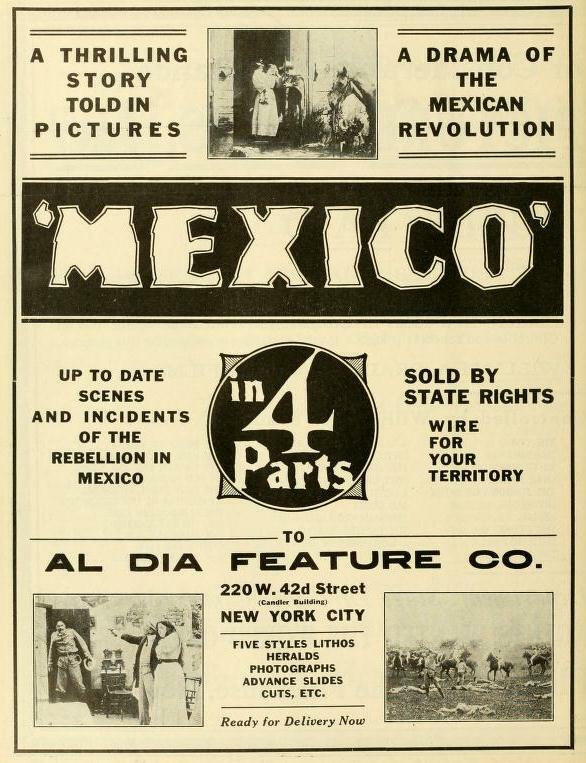 A touch of real Mexico will be found in the four-part feature of the Al Dia Company. This will set it off as different from many American made pictures dealing with incidents of a somewhat similar nature. Then the story is better than usual. It is a romantic, military melodrama with its main incident sincerely set forth and quite believable. It is helped greatly by many small episodes, bits of business and the like that not only ring true but are filled with suggestions of things different from what we have been used to. It has an atmosphere that has not been on the screen very often. In getting glimpses of Mexican nooks and corners, in seeing what looks like a true revolutionary camp, etc. ; the spectator feels that he is getting instruction. The producer of the picture seems to have had a first-hand knowledge of things that went into the making of his story. The acting is natural and effective in portraying the story’s emotions to us. As it opens we find a young Mexican, Lopez, living in Juarez. He has joined the revolutionary party. The Federals advance toward the town and Lopez receives an order from Villa to join the forces. This he does leaving his wife Rosa, and baby in the care of her father, a doctor. The Federals arrive and with them is Lieutenant Toro, a brutal officer. He breaks into Lopez’s home searching for conscripts and takes a fancy to the wife; but the arrival of his superior officer keeps him from doing her any injury. In a convincing series of scenes a revolutionary spy is now caught on the outskirts of the town. This spy is to be Toro’s agent and is set free after giving a promise to help in capturing Lopez’s wife. An attack is made on the cabin; it is set on fire and Rosa is carried away; but Toro, in fear of a court martial, sets her free and she takes refuge with her father. Toro’s next move is to decoy Lopez to the town and destroy him. 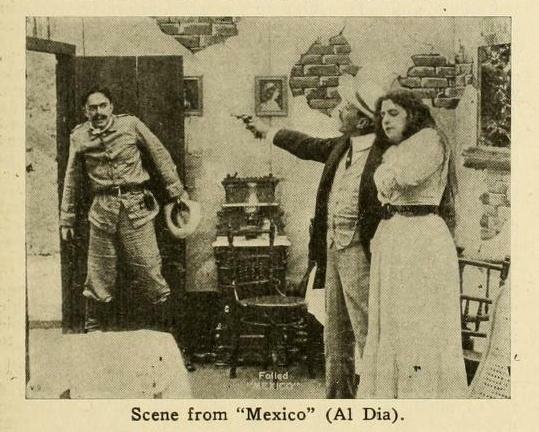 The spy is sent back to the revolutionary camp and tells Lopez that Rosa is unfaithful. Lopez leaves camp without permission, has a brisk encounter with a Federal sentry whom he throws over a cliff, and finds Rosa still true to him. There is very commendable art in this meeting of wife with husband, and the acting conveys the changing emotion of it to us with justice and sense of proportion. It is followed by the attack of Toro’s men on the house. Lopez is surprised, but makes his escape through the window and as those waiting outside give chase he fires killing the spy; but is himself captured. The court martial scene that follows also evidences the pleasing human qualities of the story that are found all through. 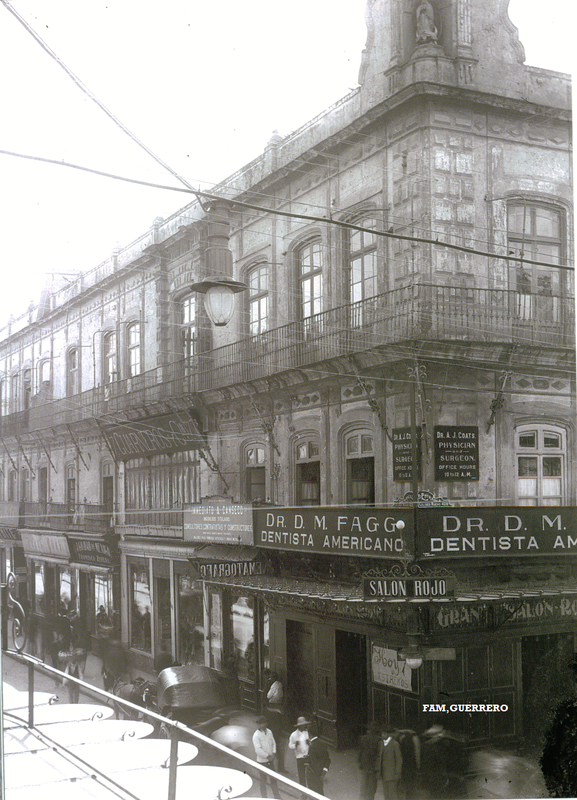 Lopez, though defended by a Federal officer as his counsel, is found guilty of being a spy and condemned to death; but is helped by his father-in-law to escape. 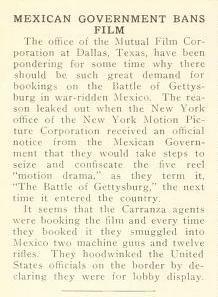 The fourth reel is a battle reel and deals mostly with an attack of a band of Federals under Toro and their repulse by the revolutionary forces. The story drags a bit, since only its ends are left to account for; but the action is brisk. The two little armies are well handled and make a good show as they deploy over the hills or collect for a last stand together. Then the fine gallantly ridden horses of the revolutionary cavalry are worth seeing. The offering on the whole will, we think, make a favorable impression on the public. It has been cheaply staged, but even its worst scene set is enough to set the story out and the story is good. One other good point in the story is its directness. The main characters are few and readily distinguished and all is carried through without complications so that one even half-asleep could understand it.